Publisher’s Note … Click here to read Part One of this article. Now let us discuss the actual methods or manners in which data is moved. These are specific implementation methods for implementing the data movement strategies we discussed above. Data Storage Layer, which converts the request into a DBMS specific request. Database neutral, in that it can access any database in its catalog. access data from a reporting environment, nor to access reference data stored in other applications. remote database need not be an Oracle system. If local users on database B want to access data on database A, then they must define a link that is stored in database B. 3.2.2 Why Use Database Links? words, a local user can access a link to a remote database without having to be a user on the remote database. be HQ database users to do their jobs; they should only be able to access HQ information in a controlled way as limited by the procedure. database users can see them. Do not create PUBLIC database links (it’s a potential security issue). A synonym can be created for the database link to simplify its use. Large amounts of data are involved. ETL is often used to move millions of rows a day to the reporting environment. Messaging methods would be better if small amounts of data are involved. however, is not the only way to achieve this. 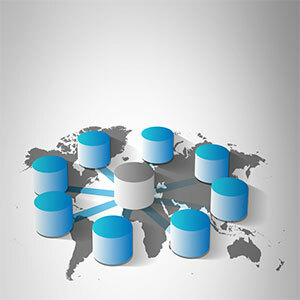 The replication services within DBMS’s are another way. Data involves periodic snapshots. ETL is more appropriate where data is captured at specific points and fixed, rather than by propagation of the event or transaction itself. is merely moved, different data movement methods, such as replication, messaging and ETL, could equally be used. over-the-counter drug product in multiple sizes but for the purpose of sales analysis and marketing we want all quantities converted to some common volume equivalent, like a 100-gram equivalent. ETL is well suited for such transformations. Reliability. If one copy fails, there is always another copy that can be obtained. Performance. Local query processing can occur. Simplification of integrity. Replicas are usually refreshed at planned intervals. These intervals are usually chosen when production requirements are more relaxed, such as overnight. Decoupling. Transactions do not usually require coordination across a network. Reduced network traffic at peak times. Updating replicas is usually performed off-hours, thereby reducing network traffic when update processing is at its peak. Replication has two main disadvantages. Storage. Each replica will consume the same amount of duplicate space as the original. Update cost. If a replica is updated, the update will have to be propagated to all copies. Performance is an issue with requesting set processing over a network. Availability is an issue if the network were to go down. Data access requirements are complex, such as doing large, complex joins over a network. Consistent data is required for analysis. The same request for the same data should yield the same results. dynamic in that its contents are selected each time the view is used. A view may combine some or all data from several base tables. A view only returns the specific columns contained in the view. Simplify query preparation. One does not have to know the detailed relationships in the base data. Help with data security. Only the data in the view is returned. Improve developer productivity. Predefined view should relieve the developer of having to repetitively code complex joins. Returns most current data. Unlike stored aggregates, which record specific derived results, the view performs the retrieval and aggregation each time the view is used. Use little storage space. Views are database object definition and contain no real data. Consume processing time. Each time the view is requested it is re-executed. Updateability. Views may or may not be updateable, depending on the DBMS. reporting or maintenance of reference data. Involving small volume of data and in result set returned. Transactional application should not process or return all the data in a given table or set of tables. The audience is clerical or operational management. Uses data exclusively from within the application. Transactional applications should also be autonomous in its usage of data. If other applications need the data, then the data should to be ‘pushed out’ or published for their usage. Using an RPC, which is loosely coupled, as in a masterfile or reference data service. Using the Data layer, which is loosely coupled, as with the Data Integration Layer/Data Storage Layer (DIL/DSL), which we saw earlier under Data Layer. Using DB links and global views, which are tightly coupled. If you have to copy data into the application, then copy only from a pub/sub authorized source. There may be workflow implications in using message queues. The application will have to decide how to process asynchronous responses. Using snapshot. A snapshot is a read-only replica of selected portions of a database. It is a tightly couple method of sharing. Push the data out to a common store or a reporting staging area. Use a queue or file method to push deltas out. Preferably one system for data entry, there may be multiple sources but the publishing point is controlled at one point. Reporting can be ad hoc, as well as preplanned, parameterized, or template reporting. In addition, sophisticated data mining can be performed, often on large amounts of data. are often the byproduct of this phenomenon. Sound data management principles, implemented with sound messaging practices, can work together over time to provide order to this state.